Yvette Cleland Features in Recruitment International’s Meet the CEO! 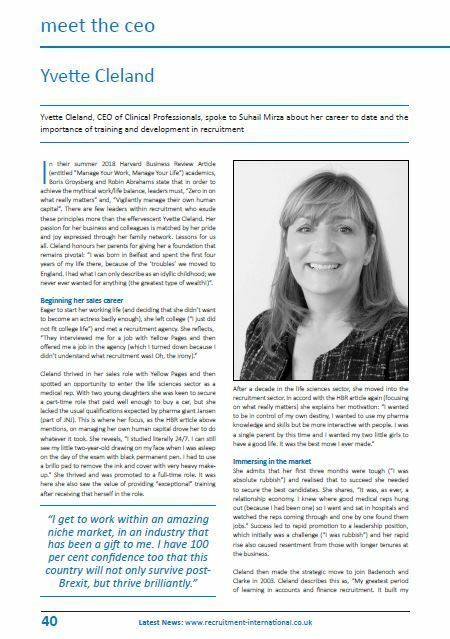 Yvette Cleland, CEO of Clinical Professionals, spoke to Suhail Mirza about her career to date and the importance of training and development in recruitment. “In their summer 2018 Harvard Business Review Article (entitled “Manage Your Work, Manage Your Life”) academics, Boris Groysberg and Robin Abrahams state that in order to achieve the mythical work/life balance, leaders must, “Zero in on what really matters” and, “Vigilantly manage their own human capital”. There are few leaders within recruitment who exude these principles more than the effervescent Yvette Cleland. Her passion for her business and colleagues is matched by her pride and joy expressed through her family network. Lessons for us all. Cleland honours her parents for giving her a foundation that remains pivotal: “I was born in Belfast and spent the first four years of my life there, because of the ‘troubles’ we moved to England. I had what I can only describe as an idyllic childhood; we never ever wanted for anything (the greatest type of wealth! )”.